"The new novel we couldn't put down...in the crisp, noirish prose of the era, Towles portrays complex relationships in a city that is at once melting pot and elitist enclave - and a thoroughly modern heroine who fearlessly claims her place in it." 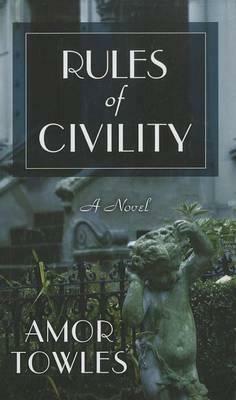 "This very good first novel about striving and surviving in Depression- era Manhattan deserves attention...The great strength of "Rules of Civility" is in the sharp, sure-handed...evocation of Manhattan in the late '30s." "Put on some Billie Holiday, pour a dry martini and immerse yourself in the eventful life of Katey Kontent...[Towles] clearly knows the privileged world he's writing about, as well as the vivid, sometimes reckless characters who inhabit it." "Even the most jaded New Yorker can see the beauty in Amor Towles' "Rules of Civility," the antiqued portrait of an unlikely jet set making the most of Manhattan."